The 3rd Byron Underwater Festival was again a massive success. Despite tough economic times, participation numbers were up 40% from last years records with close to 80 people participating in this years photo and video shoot-out competition competing for close to $40,000 in prizes. To our knowledge this has now become the largest underwater shoot-out competition in the Australasia region. The prizes won included cameras, underwater housings, dive gear and dive trips to Fiji and Indonesia. Biggest winners were Ballina resident Mark Gray who scored both overseas trips for the winning image in the SLR camera category as well as 2nd prize in the Underwater Portfolio. Yamba resident Chis Hamilton won 1st prize in the portfolio category and a dive gear package worth more than $5000. In the video caetegory Kieren Curry from the Gold Coast won some highly valued video lights with his excellent narrated video entry. Compact category winner Dave Bryant from Melbourne won a digital SLR housing to move his photography to the next level. See all the winners here. Two local school groups went out with sponsor cameras to take underwater photos for the first time and had whole school projects devoted to this. The Marine Visions III open medium art competition held as part of the Underwater Festival in conjunction with Retrospect Galleries saw many excellent entries including sculptures, photographs and some amazing fine art. Droves of people attended the launch event on Friday and it was pushing room only to get close to the works. 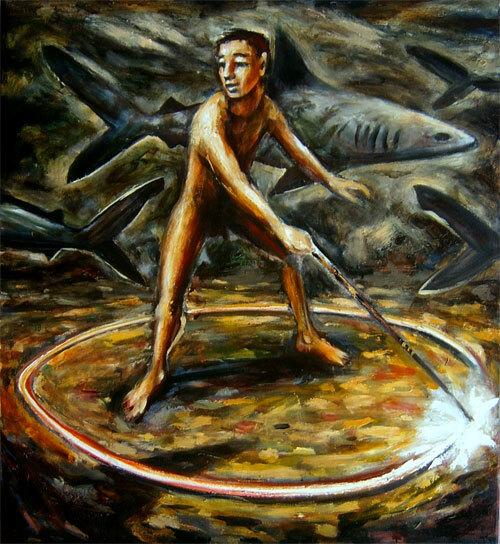 Winner of the fine art prize was Steven Giese with his work “Spell for the Protection against Sharks”. Some works can still be seen at Retrospect Galleries this week. Part of this year’s Byron Underwater Festival was also the world premiere screening of the 2nd installment of David Hannan’s best-selling film ‘Coral Sea Dreaming’ – fully shot in High Definition. The night was a sell-out and the personal introduction to the film by world renowned underwater cinematographer David Hannan himself made the screening a huge success. The film will be released on DVD and BlueRay later this year. Other highlights of the festival were the underwater photography clinics by Mathieu Meur, who flew in for this festival all the way from Singapore. His clinics were sold out quickly and participants were putting their new learned skills to test immediately. Mathieu who authored 3 books on digital underwater photography also gave a free public lecture at the Byron Bay Community Centre during the week. Guest of honour for last 3 years, Australia’s own underwater pioneer Neville Coleman was back this year to give public lectures and to coduct an ‘Underwater Naturalist’ course, which was a great success. Neville is the author of over 60 books and well known for his passion for the underwater world and the small and unusual critters it contains. Listening to him talk about his many decades of exploration is an inspiration and for those who managed to meet him during the festival will realise what an amazing person he is.